Enjoy the taste of the tropics in your own home with this really easy-to-make Cuban Bowl. 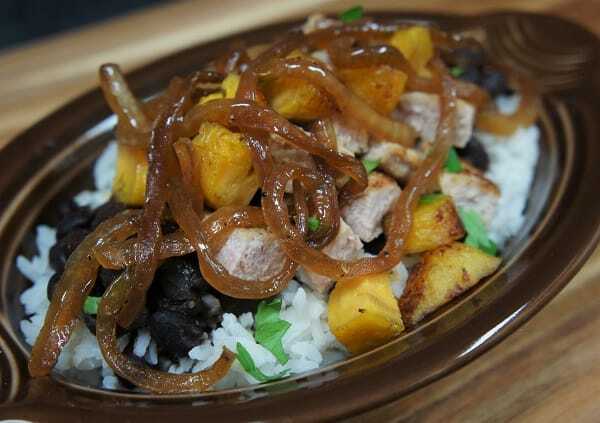 A layer of white rice is topped with black beans, pan-fried pork steak, sweet plantains and finished off with golden, sweet onions. Don’t worry about not finding the ingredients needed, Latin food brands (like Goya) are really expanding their reach. So stock-up on tropical ingredients, because this Cuban bowl is so tasty your family will ask for it again. Enjoy! Bring the water to a boil over high heat. When the water is boiling vigorously, add the rice and 1 tsp. of salt, stir. Lower the heat to medium, and boil the rice uncovered, until most of the water has cooked out, you should be able to see the rice on the surface, approximately 5-7 minutes (stirring only once or twice during this step). Lower the heat to low, stir the rice and cover. Cook the rice on low for about 25 minutes until done. Uncover the rice, fluff with a fork and set aside. Note: Once the rice is on low and covered, do not stir to prevent it from getting gummy. Add 1 tsp. kosher salt, garlic powder, onion powder, cumin, dried oregano, and black pepper to a small bowl. Stir well to combine the ingredients, set the seasoning mix aside. Sprinkle the pork cubed steaks on both sides with the seasoning mix, set aside. Note: If you are unable to find the pork cubed steaks, purchase pork loin steaks and pound thin using a mallet. The pork steaks will only take a few minutes to cook. Make sure your rice is almost ready and prepare the black beans and plantains. Add the black beans to a small saucepan set over medium-low heat cook until hot. Cook the frozen sweet plantains following package directions. I like to use the stove-top frying method. Keep warm until ready to serve, slice or cube right before serving. ​In a large skillet, heat the canola oil over medium-high heat. When the oil is hot, but not smoking, add the pork steaks to the skillet. Cook the pork steaks for just 2-3 minutes per side. 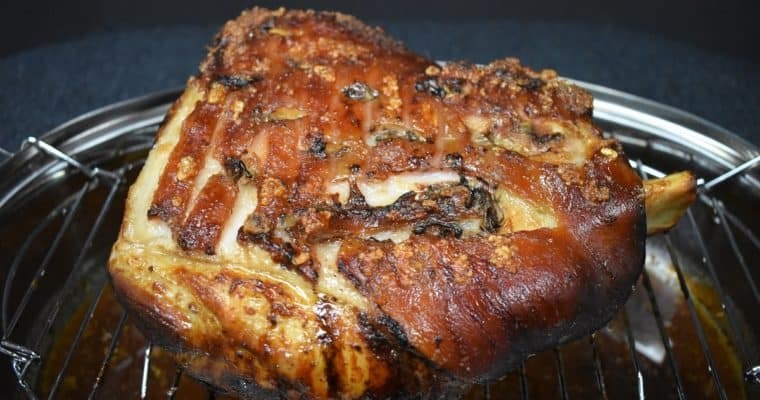 As soon as the pork turns a golden color in spots, turn it over and repeat 2-3 minutes. Remove the pork steaks from the skillet and place on a cutting board or plate, set aside. Let the pork rest for a couple of minutes, then slice or cube when ready to serve. Take the skillet off the heat while you remove the pork steaks – do not wash the skillet. Place the skillet back over medium heat and add the onions. Cook the onions, stirring frequently for a few minutes, depending on how well-done you like your onions. Remove them from the skillet and set aside. Add a generous amount of rice to a bowl, top with black beans. 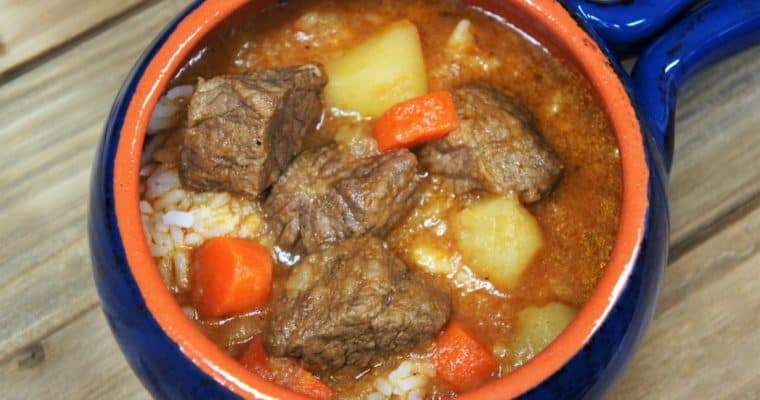 Next, add the pork and the sweet plantains and top it all off with the cooked onions and a sprinkle of parsley, if using. Enjoy! Find Cuban style ready-to-eat black beans in most supermarkets, there are several brands. If you can’t find them, look in the international food aisle. The frozen, sweet plantains, may take a little bit more searching. Look in the frozen aisle; they may have an international section. Try large supermarket chains, they carry a larger selection and you’ll probably have better luck. Here’s a little tip: I use ready-to-eat black beans all the time. In my house, they’re a staple. Truth is, I don’t just open a can, heat it up and serve. I add my own touch to the canned beans. My mom would call it “fixing them”. For each 16 oz. can of beans I add 1 generous tablespoon of extra virgin olive oil, a teaspoon or so of red wine vinegar, 1 -2 dashes of garlic powder, 1 dash of cumin and a hearty pinch of dried oregano. Then I give the beans a good stir and heat on medium-low to low until they’re simmering, stirring occasionally so they don’t stick to the pan.